The kettlebell swing is pretty much the king of all kettlebell exercises. Very few kettlebell movements work as many muscle groups and recruit as many muscle fibres as the kettlebell swing does. In fact, very few exercises with other more traditional pieces of equipment give you as much bang for your buck as the mighty swing does. They work almost your entire body in one single rep. At the lowest portion of the motion, your legs are doing the work and at the top of the swing, even your neck muscles are engaged in order to stabilise the weight. Even muscles like your chest can be recruited in the kettlebell swing, albeit in an extremely minor, supporting roll. What I mean by this, is that due to the nature of the exercise, almost every part of your body is involved. Even if a muscle is not a primary mover in the exercise, it most likely plays some part, however small, in stabilising your body throughout the exercise. But undoubtably, one of the primary muscle groups this exercise targets would be the posterior chain. Your posterior chain is the muscles that are on the posterior of your body. So in simple and contextual terms, you can think of your posterior chain as being the muscles on the rear of your body. Muscles like your glutes, hamstrings, rear delts and essentially the entire musculature of your back. Your lats, your rhomboids, your traps, etc. A lot of the posterior chain muscles are involved in pulling exercises. Your biceps are involved in all upper-body pulling motions so they can be classed as part of the posterior chain, even though they’re located on the front, or anterior, of your body. As you might have guessed from the name, the posterior chain is what allows you to maintain a strong, safe and healthy posture. Both when exercising or just leading your daily life. Your posterior chain is responsible for hip extension and the large majority of your bodies general movement, like running and jumping for example. The hip extension is a vital portion of the kettlebell swing. You need to be able to generate force with your hip extension in order to explode the weight upwards. This part of the exercise is arguably the most important part of the swing. So essentially, the most important part of the kettlebell swing is achieved by using your posterior chain. If your posterior chain is weak, you’re going to have a tough time exploding your hips successfully. But conversely, by lifting that weight, you work your posterior chain greatly. Your back muscles and your shoulders are active at the top of the motion to stabilise the kettlebell so they’re getting an intense workout too. The posterior chain is also active during the eccentric portion of the swing, the downward part. Your back, once again, helps stabilise the kettlebell as it returns back down towards the ground. The kettlebell swing gives an intense workout to every part of your posterior chain as well as helping you keep a strong posture to ward off things like back injuries and other nasty structural conditions. Just as important as the posterior chain is the core. Many people think of your core as just the abs. The vanity muscles that you show off on the beach but that’s not true. Your core is comprised of pretty much your entire midsection. Four abdominal muscles are included in the core muscle group, including your rectus abdominis, internal and external obliques and your transverse abdominis. Even your lower back and spinal erectors are considered part of your core. With the kettlebell swing, and exercise and functionality in general, the core is responsible for stability. If you didn't have a core, your body would just collapse under the weight of itself. The core makes it possible for you to do just about anything physical. There isn't any one part of the multi-faceted kettlebell swing where you can point out where the core is involved. It’s involved heavily in every part of it. Your core should be engaged throughout the whole exercise. From the squat-like position, all the way up to when you’re almost standing, that core should be engaged. It should be engaged for both exercise effectiveness and general safety. Your core makes sure that the exercise runs smoothly without violent jerking motions that can cause injury. 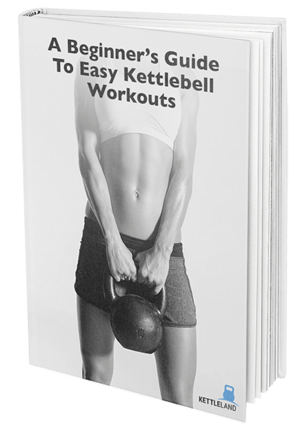 Kettlebell swings can be far more effective for working your six pack abs than doing hundreds and hundreds of almost pointless crunches. Also, due to the kettlebell swing being a full body movement, you can use heavy weight without worrying about developing a large, muscle gut from too much core involvement. Almost every leg muscle is involved to some extent in the movement. The legs are mainly involved with the squat type portion of the exercise but it doesn’t just end there. Like the other muscle groups, even when not actively working, they help provide stability to the whole body. Thereby being worked throughout the entire exercise. Your legs will get a good workout with the kettlebell swing regardless of how heavy or how light you go. Some people even find that doing high rep, low weight workouts increase leg size more than heavy weight, low rep protocols. At the bottom of the movement, you use your quads and your glutes to drive the weight back up before engaging your hamstrings to swing the kettlebell up to eye level. Like I said, regardless of what weight you use, you’re going to get some strong leg engagement with this exercise. The hinge portion of the movement also uses your hips more than your knees so you don’t have to worry about unnecessary stress to your knee joints like you would with squats. As I stated above, the kettlebell swing is a full body movement. This means that to some extent, however tiny or minor that may be, almost all of your body is recruited to perform the rep adequately. Deep into a swing set, you might even find that the very top of your chest is beginning to burn and ache. Your shoulders, traps and chest are very closely located and your chest can be recruited at the top of the motion in order to help support the load. Though you may not feel it’s involvement unless you’re already pretty taxed. It’s paramount that you keep a good posture throughout the movement which can effectively tax your neck muscles too. If the kettlebell swings are done properly and you really give it your all, you could find your whole, entire body aching and sore afterwards.